A courtyard in San Miguel de Allende, Mexico caught my eye one summer afternoon. 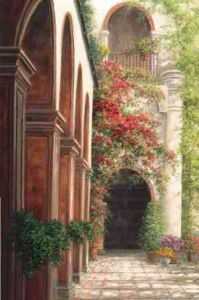 As I gazed in through the towering archway entrance, I was immediately invited to enter by the sight of red bougainvillea crawling gracefully up the stucco walls of the old building. I hope you will enjoy the "Courtyard Garden" as much as I did.